Derivative values of the function at the points in x values. This node has no optimal step. To obtain highly accurate values of differentiation, start with the symbolic differentiation by hand, and then use the Evaluate y = f(x) (Optimal Step) node, where f is the derivative of the function. 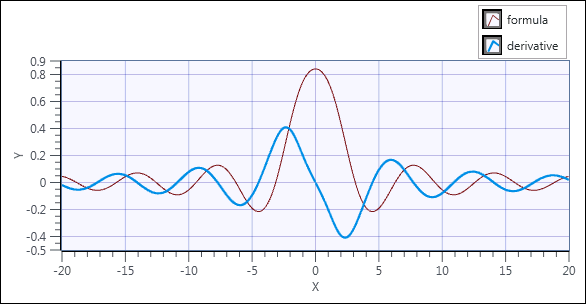 The following graph shows the function values and the derivative of function f(x) = sin(sinc(x)) in the interval (-20, 20).